Join the Movement, Get SolarCoin Stickers! You can order SolarCoin stickers by sending us §SLR. We will post them to you. Price: 40 §SLR/SolarCoin Sticker + 20 §SLR Postage. Each MEME that makes it through the monthly contest wins 50 §SLR given by Solcrypto. These MEME’s are #tagged on twitter as #solarcoinmeme and our twitter machines tag all. 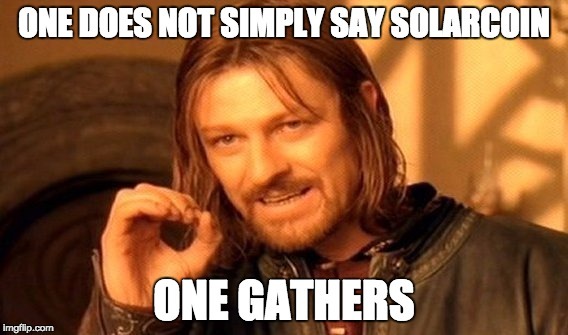 You can also retweet to @solcrypto if you want to be sure that we don’t miss your MEME. If you want to engage, you can teach your friends/acquaintances and colleagues about SolarCoin, ElectriCChain and the movement. Step 1: Login to your Solcrypto account. Step 2: Once logged in, click on the "My Account" tab. Step 3: Find the "Bounty Codes" sub-tab, If you do not yet see any bounty codes listed below, then please "Edit account" -- do not change anything -- scroll all the way down --- and click on "Save". Then come back to the "Bounty Codes" tab to see your unique codes that have been created. Step 4: If you want to submit your meme to the competition, please put your "Networker" code (looks like this pattern "nsy-27471575140") somewhere near your meme so that it can be easily seen, make sure to tag your meme on social media. Step 5: On the last 7 days of the month voting begins, there will be instructions on SolarCoin-Group #slack on how to vote for your favourite meme, please keep your "Networker" code handy. Step 6: When the winner is announced, the winning meme will be certified inside the SolarCoin blockchain on the last day of the month with the winning "Networker" code. Step 7: Winner will be contacted in Solcrypto, and winnings sent to their own specified SLR address. In this level you can talk to your friends/colleagues/acquaintances about SolarCoin, and, if they have solar panels producing solar energy, and they are owners, you can refer them to Solcrypto. Then once you have a user account you can generate a "Gatherer" referral code. This "Gatherer" code is then used to track the claim in our system. You can keep 2 §SLR of every 10 bonus §SLR given out as a bounty. Solcrypto focuses on the Asia Pacific. So we can only bounty hunt for claims in Japan, Korea, Australia, NZ and Thailand. Step 3: Find the "Bounty Codes" sub-tab, If you do not yet see any bounty codes listed below, then please "Edit account" -- do not change anything -- scroll all the way down --- and click on "Save". Then come back to the "Bounty Codes" tab to see your unique codes that have been created. In this case you are looking for your "Gatherer" code. Step 4: Your friends/colleagues/acquaintances then goes through the normal documentation process to claim SolarCoins in the "Apply for SolarCoin" tab and please ask them to put YOUR "Gatherer" code (looks like this pattern "gsy-26026169210") in the claim form. Step 5: Solcrypto will be automatically notified and then we will send your claims to the SCF for their approvals via private API. Step 6: Awarded rewards grant holders will be contacted in Solcrypto, and winnings sent to your friends own specified SLR address, and in addition your own specified SLR address. Setup a SolarCoin client machine on your own IoT. That could be Raspberry Pi or similar. Once this is setup, you can then login to Solcrypto and generate a high level bounty hunter referral code. This allows you to keep an amazing 4 §SLR of every 10 bonus §SLR given out as a bounty. Step 3: Find the "Bounty Codes" sub-tab, If you do not yet see any bounty codes listed below, then please "Edit account" -- do not change anything -- scroll all the way down --- and click on "Save". Then come back to the "Bounty Codes" tab to see your unique codes that have been created. In this case you are looking for your "Hunter" code. Step 4: Your friends/colleagues/acquaintances then goes through the normal documentation process to claim SolarCoins in the "Apply for SolarCoin" tab and please ask them to put YOUR "Hunter" code (looks like this pattern "hsy-66912796099") in the claim form. You will also be prompted to add your own SolarCoin public address so we know where to send your reward. Step 6: On your Raspberry Pi, or similar IoT device, record your IP address, or generate a unique hash and screenshot this in your environment, then send your "hunter" code to a blockchain hash and let us know the hash number. Step 7: Awarded rewards grant holders will be contacted in Solcrypto, and winnings sent to your friends own specified SLR address, and in addition your own specified SLR address. In addition if you put a uniquely generated hash into the solarcoin blockchain TXMessage space from your masternode, we will send an additional 1 §SLR after the transaction is approved by the SolarCoin API. Contact Solcrypto and see if your country is on the list of Solcrypto website affiliate coverage. This needs language localization and some promotion at some of your local crypto and solar energy meetups to construct your own forward community facing website, and then you can interact with the SCF back end private API that has been developed. You also need to have a screening process by Solcrypto and the SolarCoin Foundation. Then you can get 5 §SLR of every 10 bonus §SLR given out as a bounty. To setup, very similar steps to "hunter" but you will need to talk to us about training to verify Solar Energy Energy produced. Join the mission, it is a big one. Remember we are building the future of the #SolarCoin and #ElectriCChain ecosystems in your image as community members! And most importantly have FUN!